Amadou Lamine Touré comes from a long line of griots, a caste of musicians and oral historians among the Wolof people of Senegal. 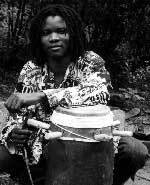 Born into a family of griot percussionists, masters of the sabar drum, Lamine has been drumming since the age of four. Growing up in Kaolack, he received his early training as part of his family's drum troupe, performing regularly at weddings, baptisms, and neighborhood dance parties. In 1986, Lamine moved to Dakar, where there would be more opportunities to exploit his talents in the burgeoning popular music style known as mbalax. 1991 marked the beginning of Lamine Touré's career as a percussionist in the modern music scene, when he formed his first group, Xiis. After playing with Keur Gi, Diaspora, the Ballet Ousmane Cissé and the Orchestre Nationale, Lamine Touré joined mbalax star Mapenda Seck's band in 1995, with whom he made his commercial recording debut, Jamilou. A fast-growing success, Lamine Touré left Mapenda Seck in 1997 to join Alioune Mbaye Nder et le Setsima Group. Since then he has enjoyed a fruitful career as Nder's percussionist, touring extensively within Senegal and throughout Europe and North America, with performances at Bercy (Paris), the Festival International de Jazz (Montréal) and Central Park Summerstage (New York). Always a highlight of Setsima Group, Touré showcases his musical talent and versatility on a wide range of percussion instruments, from sabar and djembé to tama (talking drum), as well as in taasu (rhythmic poetry, similar to rap). Lamine Touré is also the founder and leader of Group Saloum, Boston's newest Afro-pop band. Lamine Touré and Group Saloum fuse Senegalese mbalax with elements of jazz, funk, reggae and Afrobeat. Group Saloum performs original mbalax music, drawing upon the collective creativity of Touré and some of Boston’s most talented musicians. Their performance debut at the Central Square World’s Fair in July 2004 was a smashing success, drawing record crowds to the African Stage. Since Fall 2002, Lamine Touré has been serving as Artist-in-Residence at the Massachusetts Institute of Technology, where he directs the Senegalese drumming ensemble, Rambax MIT. He continues to teach sabar drumming and dance classes in the Boston area, conducting workshops and lecture-demonstrations at local schools and universities. 2002: Nder et le Setsima Group - Lu Tax? 2000: Nder et le Setsima Group (Africa Fjte Diffusion, AFR2-1320). 2005: Lamine Touré and Group Saloum (Nomadic Wax).